Ancient walled city, setting of Game of Thrones, and one of the most beautiful cities in Europe! 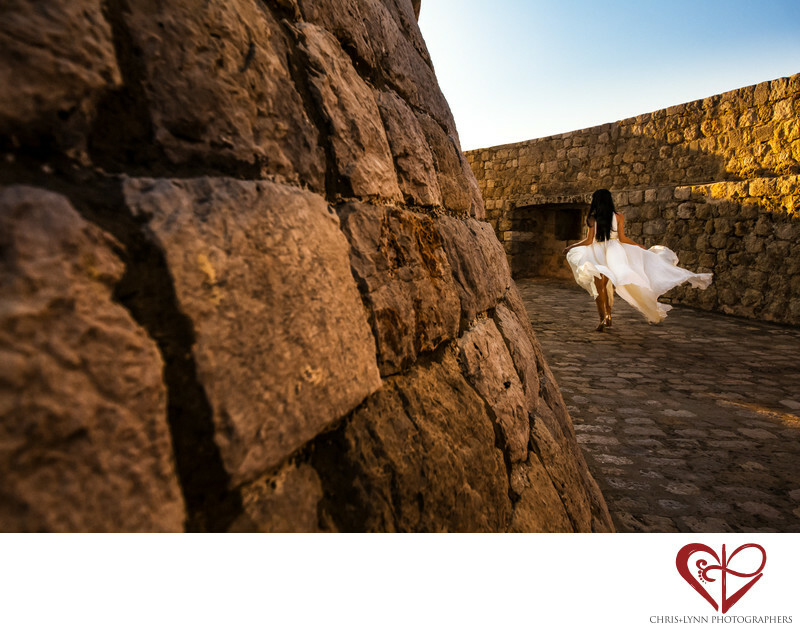 As wedding photographers, we highly recommend every couple who visits Dubrovnik walk along the high fortress walls of the Old Town at sunset - so romantic! Though packed with tourists the majority of the day, starting the walk right before they close they gates for the evening ensures you'll have less crowds and more time to enjoy the views. This photo was taken near Minceta Tower as a gust of wind blew the bride's dress dress up and behind her. We loved the flow of the dress combined with the golden light. This image was shot during one of our popular YOU+ME Bride+Groom sessions. These destination wedding portrait sessions (sometimes referred to by other photographers as 'Trash the Dress' sessions) usually take place one or two days after the wedding and can also happen a few days prior. It allows us to go to scenic, unusual and exotic locations further from the actual wedding venue without any stress of rushing back for the reception! We can also go to locations at the time of day that will be most flattering - usually beginning about ninety minutes prior to sunset & ending at twilight. 1/400; f/8.0; ISO 400; 24.0 mm.